Some people wanting to have their say on plans for the Stonehenge tunnel project were given the wrong date for a preliminary meeting. The meeting, to set the timetable for the six-month examination procedure, was taking place at Salisbury Racecourse on Tuesday. However, more than 400 people were sent a card giving the date as 4 April, instead of 2 April. One woman, who fears she could lose her house, said her views must be heard. 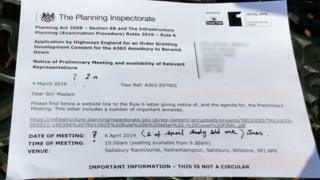 A Planning Inspectorate spokesman apologised for the incorrect date being given out. Mary Sebborn, who lives close the proposed location for a new flyover at the Countess Roundabout on the A303, said she only learned of the correct date after speaking to a friend. "It's very rude, they should have followed up if they found out they'd put the wrong date," she said. She said it was important for her views to be heard at the meeting, which set the procedure for the way in which the planning application will be examined. She attended the meeting after discovering the correct date. The government wants to build the tunnel to hide the busy A303 near Stonehenge, but opponents say it could destroy archaeological treasures. A Planning Inspectorate spokesman said the error was "quickly corrected in a letter sent the following day to everyone who received the incorrect notification". Work on the project is due to begin in 2021.